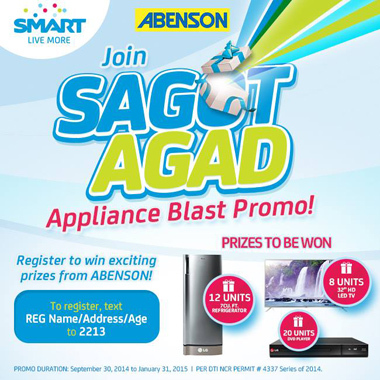 Join the SMART and Abenson Sagot Agad Appliance Blast Promo and get a chance to win exciting home applicances such as LG Led TV, Refrigerator and LG DVD Player. To join, you must be a SMART Prepaid or Talk ‘N Text subscriber, register and text Sagot Agad and send it to 888 for FREE! To join, Text REG<space>Name/Address/Age and send to 2213. Registration is FREE. ONE (1) registration per mobile number. A charge of Php 1.00 for any succeeding registration attempts with the SAME mobile number. To earn entries, Text SAGOTAGAD PREPAID or SAGOTAGAD TNT and send to 888. Sagot Agad is FREE of charge. Must have at least P1.00 regular balance. DTI Permit Number 4337 Series of 2014. Visit smart.com.ph/abensonpromo for full promo details. You can also visit Smart Communications and UnliPromo Facebook page for the latest promos and updates.